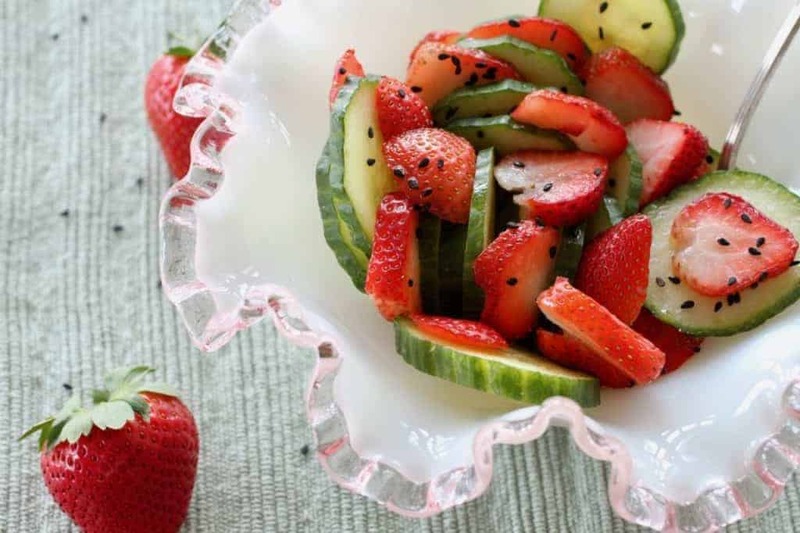 With just 5 ingredients, this refreshing Strawberry Cucumber Salad is quick and easy! The cheerful song means the birds are back, and that means spring has arrived. Not sure if it’s the bird, the extra evening light or the calendar, but I’ve been on a spring cleaning tear. I’m not alone. I’ve heard others are pulling out cleaning supplies. The extra effort is good for our well-being. Clutter has the potential to add pressure and fuel stress because it is hard to feel settled when things are in disarray. Order feeds your soul. My sweaters are stacked by color. So are my shoes, well, sorta. Maybe you want to organize your pots and pans or the drawer of storage containers. And toss those lids that don’t have a mate. If cleaning and organizing isn’t your thing, try one of my tricks. A jam session. I set a timer for 60 minutes and focus on one project. It’s amazing how clean your refrigerator gets when you zero in. Are your kitchen counters cluttered? Jam on that. When you keep food on the counter, you’re likely to snack more than those with tidier counters. I did a 30-minute jam session to arrange spices alphabetically. Spices give our immune system a boost. They also reduce inflammation, which contributes to heart disease, cancer, diabetes and other chronic disease. When they are easier to find, we’re likely to use them more. 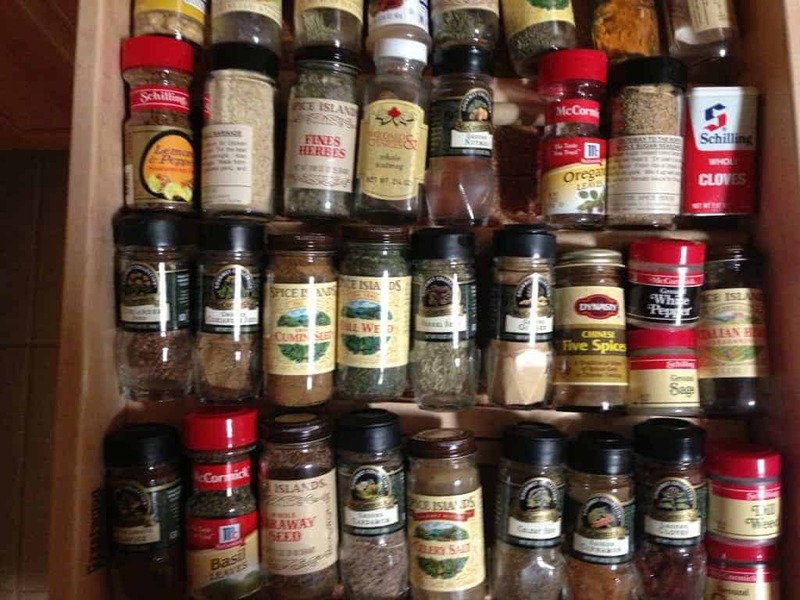 I store some spices in a drawer and some in the cupboard on an expandable, tiered shelf so I can see them. The fresher the spice, the greater the benefit. 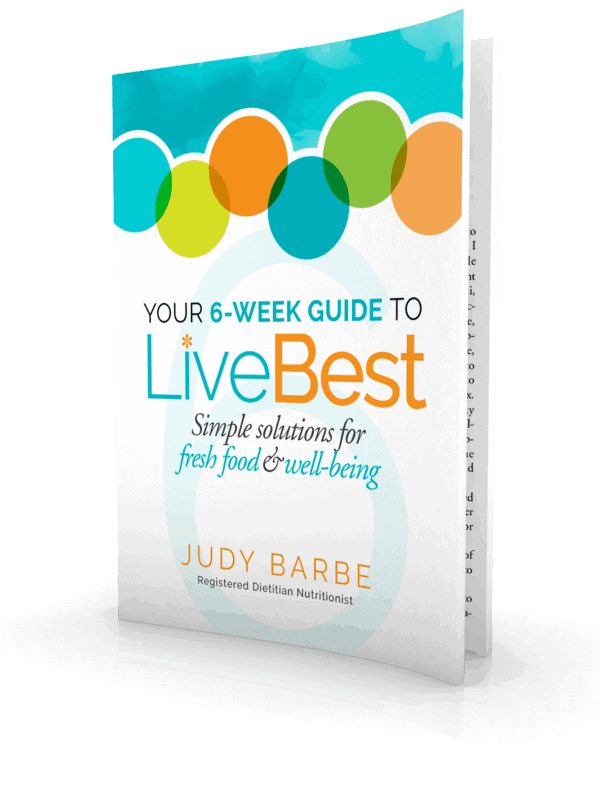 Test freshness with your nose. If it smells strong and flavorful, it’s probably still potent. To smell whole spices, such as peppercorns and cinnamon sticks, crush or break them to release their aroma. Label when you buy them to track shelf life. Ground spices last about a year, while whole spices last for two. It’s best to store spices and herbs away from heat and moisture, so that means away from your oven, stovetop, refrigerator, dishwasher or heating vent. During cooking, remove the spice from the container with a dry spoon. If you sprinkle directly from container into a steaming pot, the moisture shortens the life of the spice. Smart Storage: How long do canned foods last? So what about other foods? According to the Canned Food Alliance, canned goods are good for at least 2 years after purchase. For quality, Kraft Foods suggests keeping salad dressing for three months; mayonnaise, two months; mustard, six to eight months and ketchup one month or longer. Unless otherwise indicated, soy sauce can be kept for many months in a cool, dark place. Tabasco sauce lasts for five years under the same conditions. And the Vinegar Institute claims that vinegar is self preserving and lasts indefinitely. The freezer is the best place for seeds and nuts. Cold temperatures protect sesame and poppy seeds and nuts from rancidity. Take them out about 30 minutes before you are ready to cook. They can be frozen, for a year or two if kept airtight. Toast spices such as fennel seed, cumin seed, sesame seed and white peppercorns to intensify their flavors. Add the seed or spice to a dry, heated skillet and cook a couple of minutes over medium heat until aromatic. The Recipe Redux is challenging food bloggers to spring clean our kitchens and make something from what we have on hand…with 3 ingredients. My refrigerator jam session had a good outcome. I created this recipe from what I had on hand. 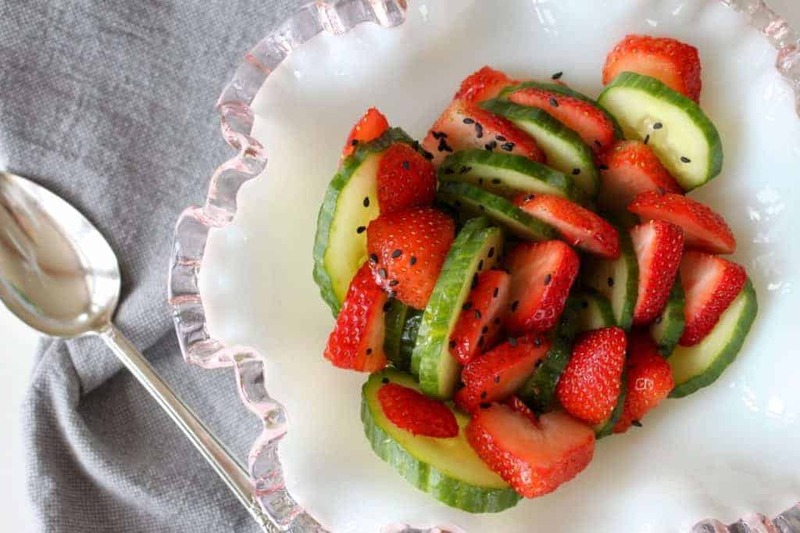 Strawberries, cucumber and the sesame seeds I found in the freezer. 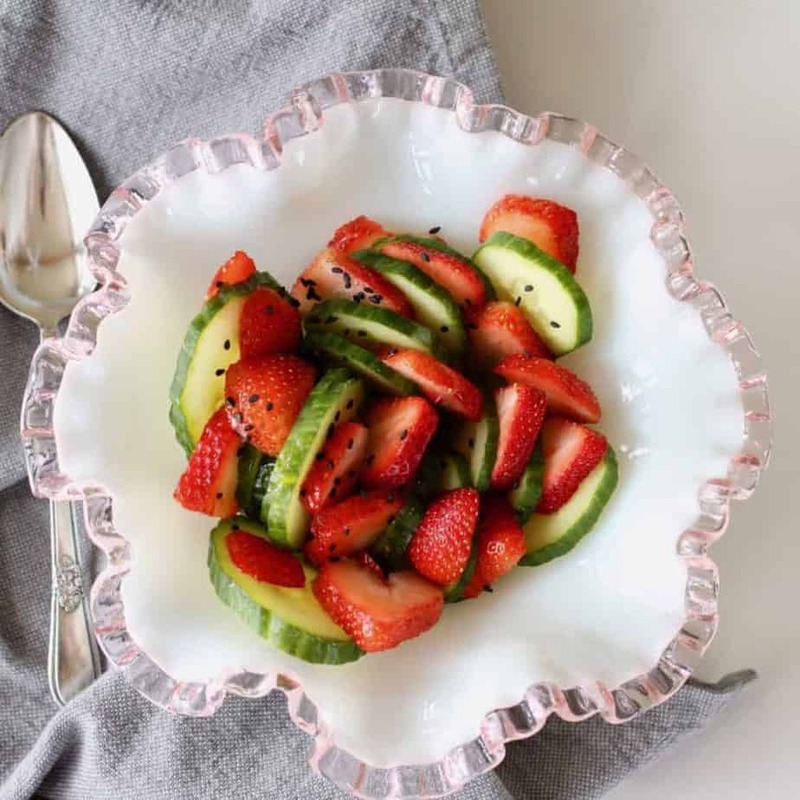 What better way to end a cleaning spree than with a super simple and refreshing salad? Let me know how you like it. strawberries are packed with vitamin C. Just 8 of these heart-shaped nuggets have more vitamin C than an orange. Oh, and fiber, potassium and health promoting polyphenols. 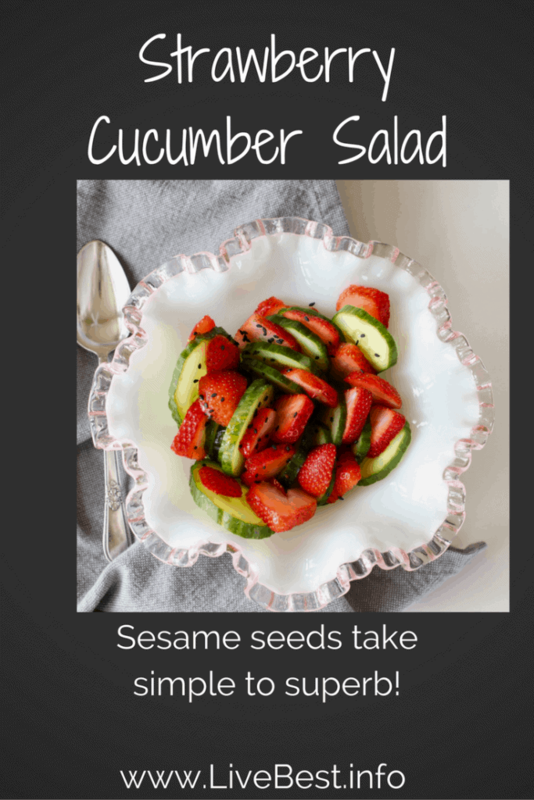 refreshing cucumbers are 95% water + have vitamin C and K.
the toasted sesame seeds take this salad from super to superb. Amazing what a few seeds can do for appeal! with just 5 ingredients, this salad is quick and easy. people are surprised the strawberry/cuc combo. I like pleasant surprises! If you have extra strawberries, try these Strawberry Basil Tarts. A sharp knife helps keep slices uniform. This is a knife I use. This post contains affiliate links which means if you click through and make a purchase, the seller pays me a commission. It does not increase the price you pay. Mix: Combine strawberries and cucumbers in a bowl. Drizzle vinegar and olive oil. Stir to combine. Sprinkle sesame seeds over top. To toast sesame seeds: Add the seeds to a dry, heated skillet and cook a couple of minutes over medium heat until aromatic. Check out how my fellow Recipe Redux bloggers are using their kitchen finds. 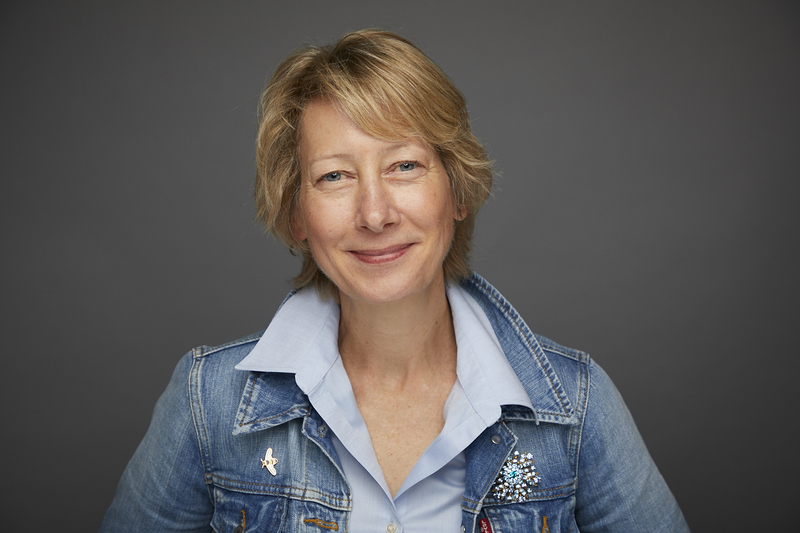 Pingback: Dietitian-Approved Luvo Salad Pairings | Luvo, Inc.